Over the last two weeks rumors have swept the satellite industry about Google’s plans to build a huge new broadband satellite constellation (dubbed “son of Teledesic” in a February article). I’ve done a fair amount of digging and since it looks like we will see this story in the mainstream press pretty soon, I thought it would be useful to summarize the analysis I produced for research clients last weekend. As The Information reported on Tuesday, last month Google hired Brian Holz (former CTO of O3b) and Dave Bettinger (former CTO of iDirect) to work on the design of a massive new broadband satellite system, as part of Google’s Access division. What has so far gone unreported are the technical details of the planned system, which is expected to involved 360 LEO Ku-band satellites using a filing by WorldVu in Jersey. The constellation will have 18 planes of 20 satellites, with half at an altitude of 950km and the remainder at 800km. I would expect the constellation to be launched in two phases, with the higher altitude satellites providing complete global coverage, and the lower satellites being added later, in between the initial 9 planes, to provide additional capacity. It also seems likely that the system could include inter-satellite crosslinks (within each of the two halves of the constellation) given the near polar orbit that is planned. WorldVu is apparently owned/controlled by Greg Wyler, the founder of O3b, who is rumored to have a handshake agreement with Larry Page to move ahead with the project. The satellite system is budgeted to cost $3B, which is a very aggressive price target (recall Teledesic was supposed to cost $10B back in 1999), based on a plan to use very small (100kg) satellites. If this ultimately proves infeasible then the cost would certainly rise: for example the O3b and Iridium NEXT systems (700kg and 800kg respectively) cost at least $40M per satellite to build and launch. UPDATE (6/1): The WSJ now has more details of the plan, confirming my supposition that it would start with 180 satellites and add the rest later. I was quoted in that article as stating that “180 small satellites could be launched for as little as about $600 million” but that should not be interpreted as a total cost for building and launching the satellites. If the target of 100kg could be achieved, the all-in cost for the first 180 satellites would certainly approach $2B, and if the satellites end up being more like 200-300kg, which a satellite designer suggested to me might be easier to achieve, then that all-in cost could reach $3B. The full 360 satellite system would likely cost $3B for the 100kg satellites and $4B-$5B for the 200-300kg satellites. Notably the satellites would use the Ku-band, not the Ka-band which has been popular for broadband in recent years. This takes advantage of the FCC and international rulings secured by Skybridge in the late 1990s, which made over 3GHz of spectrum available for NGSO Ku-band systems, so long as they avoid interfering with satellites along the geostationary arc. In practice this means turning off the satellite when it is within about 10 degrees of the equator and handing over to an another satellite that is outside this exclusion zone. WorldVu apparently has priority ITU filing status with respect to this huge amount of spectrum on a global basis. The total system capacity is unclear, but it could certainly be 1-2 Tbps or more for the full constellation, although not all of this will be usable (for example in polar and oceanic regions). Importantly, any LEO system would be critically dependent on the successful development of Kymeta’s new flat panel meta-materials antennas (which are being developed initially for Ka-band, but could also be extended to operate in Ku-band), because otherwise the need for tracking dish antennas makes it impossible to build terminals cost-effectively. After all, this terminal problem ultimately proved terminal for Teledesic in the late 1990s, and O3b is already telling potential enterprise customers that they should look to Kymeta to provide a viable low end terminal in a couple of years time. Construction and launch of the first half of the constellation could probably be achieved within 5 years, if the satellites were small enough for dozens of them to be launched at once, and sufficient launch slots could be secured. However, it seems Google has not yet engaged actively with satellite manufacturers to seek their input on design feasibility (let alone bids) and so it might be premature to expect any formal announcement (and for the clock to start running on construction) at this stage. Nevertheless this prospect is causing considerable excitement amongst satellite manufacturers, who had been bracing for a potential decline in business after record orders in recent years, and corresponding trepidation amongst satellite operators, who were already wary of a potential price war (and accelerated depreciation in the value of some older satellite assets) brought on by new high throughput Ku and Ka-band GEO satellites. Those investing in new broadband satellite systems of their own (like Intelsat, Inmarsat, ViaSat and Hughes) will certainly have to take this wildcard into account, but like the movie, only time will tell if Google’s space odyssey is going to be regarded as more than just dazzling special effects. Yesterday, Harbinger’s new lawyers at Cooper & Kirk, filed an ex parte with the FCC, documenting a meeting last Friday with FCC staff, plus two representatives of the DoJ (who would presumably defend the FCC in the event of a lawsuit), including Alicia Simmons who signed the devastating Jan 17 filing in LightSquared’s bankruptcy case. The FCC personnel included Associate General Counsel Jennifer Tatel and the letter also identified Hillary Burchuk as an FCC staffer, although she is in fact apparently a DoJ trial attorney. Interestingly, Cooper & Kirk has never filed an ex parte with the FCC in the past, and Harbinger has previously been represented at the FCC for many years by its regulatory law firm, Goldberg, Godles, Wiener and Wright. It seems pretty clear that the purpose of the meeting was to threaten to sue the FCC, not least because Cooper & Kirk’s own website boasts that according to Legal Times, it is “The top choice for plaintiffs who want to sue the federal government.” This may be Falcone’s last effort to avoid being excluded from the resolution of LightSquared’s bankruptcy case, where (as I concluded) Judge Chapman’s decision to reject the LightSquared bankruptcy plan has made it far more difficult for Harbinger to maintain a stake in the reorganized company. On Tuesday the LightSquared stakeholders were ordered to mediation, as expected, although reportedly some progress had been made on a “global restructuring” deal. That phrasing would suggest the aim is to keep the 1670-75MHz spectrum together with the L-band MSS spectrum, rather than auctioning the two pieces of spectrum separately, perhaps with the holders of the 1670-75MHz secured debt being paid off via a new injection of capital. If that deal comes to fruition it would suggest that the target would still be to gain access to the NOAA 1675-1680MHz spectrum, in which case it might also make sense to keep Ergen in the capital structure (in order to avoid the threat that DISH or EchoStar might bid against LightSquared in an auction). But its harder to see what bone might be thrown to Falcone to prevent Harbinger from filing suit against the FCC. Google’s Project Loon has been in the news again this week, with confirmation that Google will now look to partner with cellular operators to use their licensed spectrum rather than acquiring its own spectrum. Indeed yesterday the FCC issued an STA to permit continued testing in Nevada, using T-Mobile’s AWS-1 F-block LTE spectrum. I’m particularly intrigued that Astro Teller of Google indicated that in late 2012/early 2013 the company spent “six months negotiating with ‘large companies’ to buy [a relatively thin piece of] harmonized spectrum,” but the plan was vetoed by Larry Page. Its pretty clear that the only “relatively thin” piece of “harmonized” (i.e. multi-country) spectrum out there is MSS spectrum and it was reported in November 2012 that Google had held discussions with DISH about their spectrum. Presumably similar discussions were held with other MSS operators like Globalstar as well (although at least as of late 2012 Google might not have considered Globalstar to be a “large” company on the scale of DISH or even Inmarsat). However, the idea of partnering with individual wireless operators in different countries is completely incompatible with the concept of using balloons which can travel around the world in 22 days, because of course different spectrum would need to be used in each country. The obvious conclusion to draw is that Google will soon be moving on from balloons to its new Titan drones, which can stay in a defined area and be configured with a specific payload that would use the spectrum available there, just as Facebook predicted. Interestingly drones would operate at the same altitude of “up to 65000ft” and therefore might conceivably even be covered by Google’s current FCC STA. So how soon will we see this change happen? Today’s ruling from Judge Chapman on the LightSquared bankruptcy case took four hours to read from the bench, and has not been issued as a formal order, apparently to give the parties involved until to negotiate and find a settlement, before they are ordered to mediation under Judge Drain. However, the oral ruling effectively sets out the parameters for that negotiation, most notably that part of SPSO’s debt is subject to subordination, and though SPSO may be treated differently than other secured debtholders, it may not be discriminated against. Though the judge apparently found Moelis’ valuation more appropriate than that offered by SPSO’s experts, she agreed that it was not valid without FCC approval of LightSquared’s license modification requests. This appears to be a clear invitation to LightSquared and Harbinger to buy SPSO out of the capital structure if they are prepared to wait around for FCC approval. In that case the main subject of negotiation would be how much is paid to SPSO in respect of its debt, and whether a) that is acceptable to Ergen and b) viable for LightSquared to raise in addition to the amount already contemplated in the reorganization. 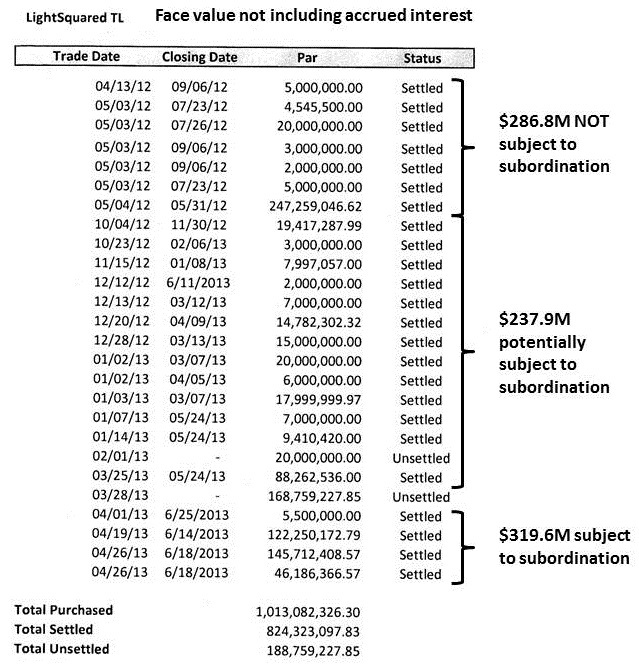 The judge did not determine a specific amount of Ergen’s $844M in purchases which will be subject to subordination, but did give a range of dates that should be considered: the $320M (face value) in purchases in April 2013 were said to be on DISH’s behalf (and therefore subject to subordination), the $287M bought before October 2012 would not be subordinated and the $238M in purchases between October 2012 and March 2013 might or might not be subordinated. Moreover, it seems that the extent to which any of these purchases would be subordinated will be dependent on the actual damages caused to LightSquared through the delay in negotiations and increased legal fees associated with the case due to the delays in SPSO closing its trades. 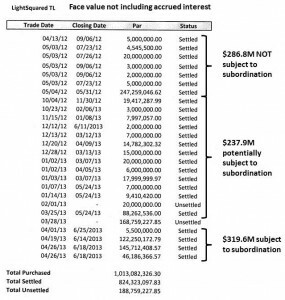 As a result it appears only a proportion of the $320M-$558M would actually be subordinated. Given that the time taken to close the bulk of these trades was around 2 months, and LightSquared’s total operating costs including interest are around $1.5M per day, it is quite plausible that the amount actually subordinated could be no more than $100M. This would mean LightSquared having to find as much as $1B (including interest) to buy SPSO out of its capital structure. Of course, its highly unlikely that Ergen would have been prepared to accept less than the $700M he paid for the debt in the first place, but if the potential damages in the form of subordination are relatively limited, then despite Judge Chapman’s criticism of Ergen’s testimony and behavior, he is still likely to be in a very strong position. 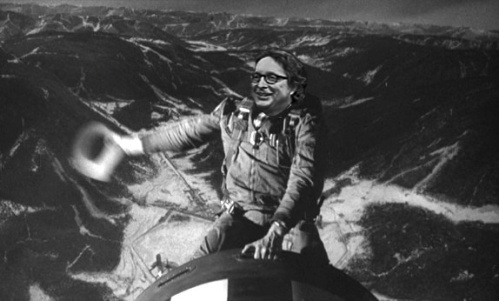 Conversely, Phil Falcone will have a much harder time coming up with a plan that will retain value for his equity holdings. I’m also left wondering about what David Daigle of CapRe, as the biggest single LP debtholder other than Ergen (with $331M in LP debt at face value), will now do, because as Falcone indicated in an email earlier this year “I believe [D]aigle is determined to reduce our position to nothing“. An alliance between CapRe and SPSO to push a debt to equity conversion of the LP debt would probably make it all but impossible for Harbinger to retain value in the reorganization, even if as much as $300M of SPSO’s debt was subject to subordination. Elimination of Harbinger’s position would be equally unacceptable to Falcone, and thus it seems rather unlikely that agreement will be reached in the next couple of weeks. The best bet would therefore be to assume we will be headed to mediation and yet more DIP financing from the LP holders to extend the process for a couple more months, probably ending up either in an auction with credit bids or directly in a debt-to-equity swap. That presumably means no money for Inmarsat in June. It also implies that the probability of LP debtholders getting paid out in cash with accrued interest anytime soon has also decreased significantly. However, in the medium term it may be better news for GPS, because the debtholders would probably be prepared to drop LightSquared’s current lawsuit against the GPS industry, if it helped their efforts to get the necessary approvals from the FCC.